I was picking up a couple of summer essentials in Superdrug and my eye was drawn to the shelves in the queue line which were attempting to up sell me various goodies. 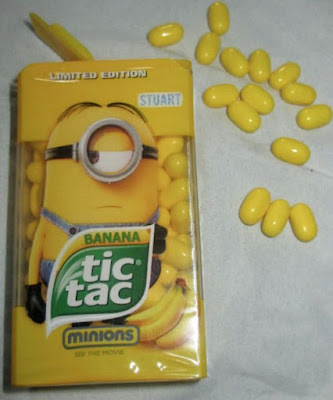 As you can imagine this works quite often with me, and I found my hand reaching over to pick up these New Banana Tic Tacs, in their fancy Minions themed pack. When I got to the till the cashier caught me looking at the large pack and also had a look "Weird flavour for Tic Tacs, will have to pick up a pack to try for myself" she said, but I agreed with her sentiment, it is an unusual flavour. The Tic Tacs are bright yellow in colour and come in large packs at 49g. I poured some out and gave one a try. I was pleasantly surprised by the flavour. It wasn't sickly sweet and artificial as I had feared, it was well balanced and flavoursome. There was a slightly warming hint of something in the aftertaste, which was also really nice. These are very easy to eat sweets, with a good real flavour. I think they have done the very best they can incorporating the flavour of banana into a sweet and not veered off in the direction of artificial banana foam sweets. These are a pleasant, mild and easy going. I like them for their novelty, the flavour is good and the Minions pack has a nice design, but I still favour the more refreshing flavours.